Wednesday Facebook Fan Favorite… Week 26 and A Crochet Secret!! Week 26 Facebook Fan Favorite was a fun choice!!! This Free Pattern Find had over 10,000 views and seems to be very popular!!! You can find this fun Free Crochet Pattern at one of my favorite Crochet Directories…The Yarn Box! The Yarn box has thousands of free patterns in their library and fun articles and information too! 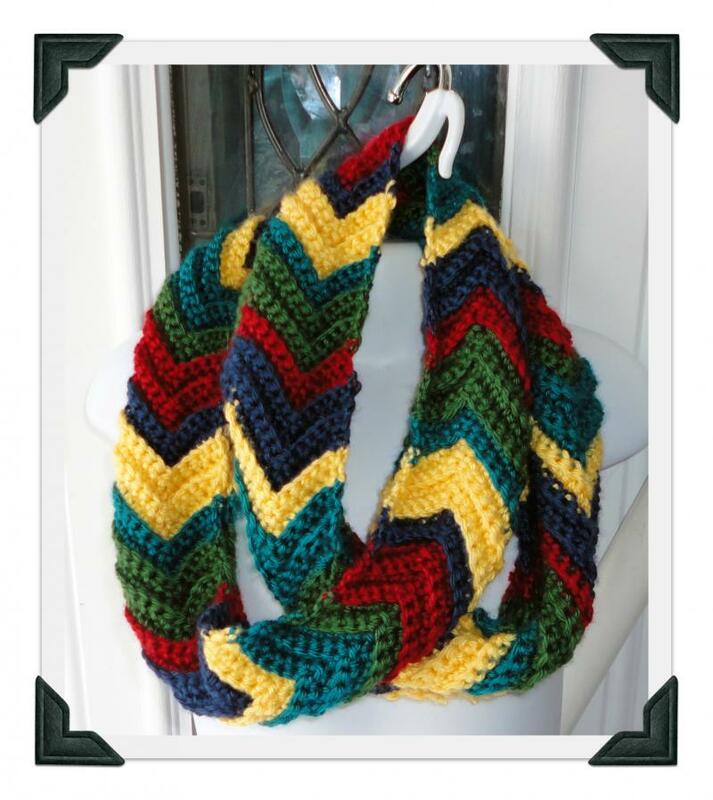 This weeks Facebook Fan Favorite is a Ripple Infinity Scarf by “I am Stacey Lynn”… Great, bright colors and looks like alot of fun to wear!! For the free pattern Click Here. 1. You must complete the full afghan pattern within 10 days of the final pattern section post! 2. You must post a picture on Facebook on the designated post (directions will be with the final pattern post) or Email me a picture of the completed afghan within 10 days of the final pattern post! 3. You must complete this third and final step… To be revealed in the final pattern section post!!! Don’t worry… It will be simple!! It’s not to late to participate in the Crochet-A-Long, It is a Free Crochet Pattern and the instructions are posted in the Crochet-A-long tab at the top of the page… We are just finishing up week 4 and Saturday I will be posting Week 5 instructions! Love the Infinity Scarf! I also am intrigued about Friday. The little bit of pattern & colors you revealed look like my cup of tea. I can’t wait to see what you have for us. I’m super excited about the CAL anyway. Now you are adding a prize to the end! This just makes it extra special. I will be waiting impatiently now for every Saturday morning. Thanks so much for making it even more fun. Thank you… Week 5 is really fun!!! How many weeks left until the final pattern section? ?